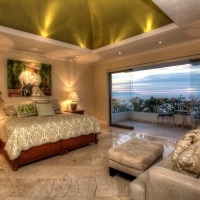 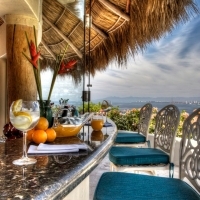 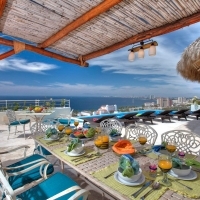 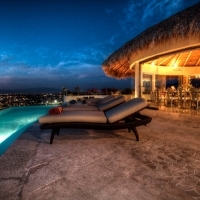 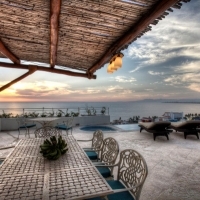 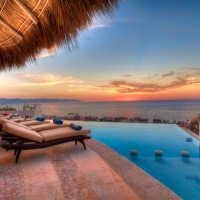 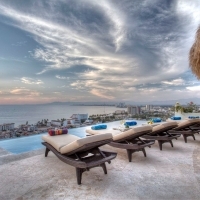 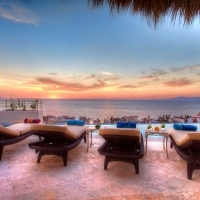 Casa Galeana is a breathtaking contemporary 6 bedroom villa with an infusion of organic and Mexican details located hillside a short walk to beach and north end of the famous Malecon oceanfront boardwalk. 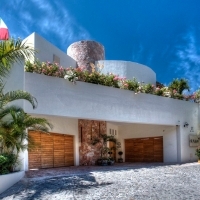 Set at the top of a hill at end of a Cul de Sac with magnificent views, yet very private and easy access to the beach and downtown areas. 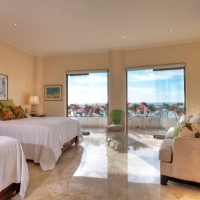 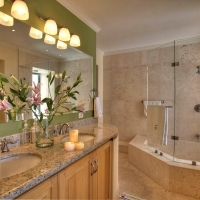 The 3 level villa features an elevator, and luxurious finishing details and appliances from Marble floor and Granite countertops and GE Monogram appliances and high quality linens round up the fundaments of this villa. 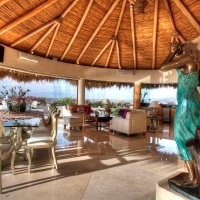 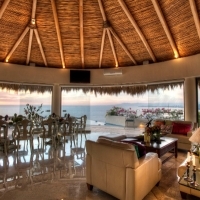 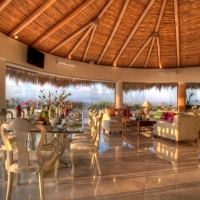 This luxury villa has a spectacular top level with open entertainment living, dining and well equipped kitchen all under a spectacular giant palapa lined with bamboo, the special design of local architect Alberto Alvarez of Villa Mandarinas fame. 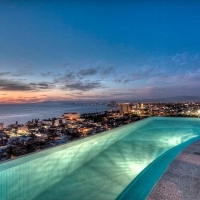 This spectacular living /entertaining area opens to a spacious terrace complete with heated infinity pool, BBQ and outdoor kitchen with breathtaking 180 degree views of the town and bay of Banderas. 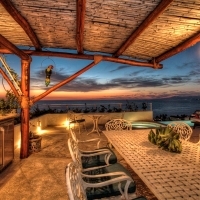 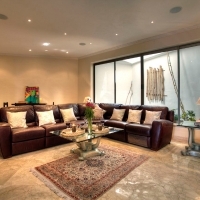 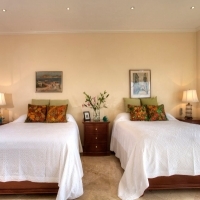 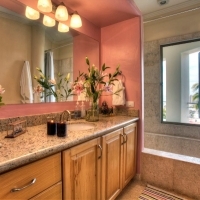 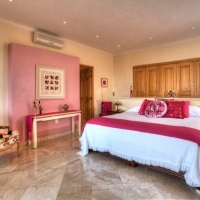 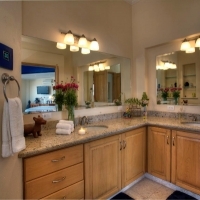 This house is ideal for families and groups of friends looking for a great time in Paradise. 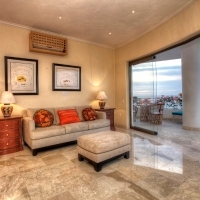  Enter the street level: with 2 Master bedroom suites each with ensuite bath, AC, TV and opening to shared terrace with breathtaking views of town and ocean  Down one level below entrance (by stairs or elevator) are 4 Bedrooms, 3 with a spectacular shared terrace overlooking the town and ocean and 1 with a private terrace and partial views of the ocean. 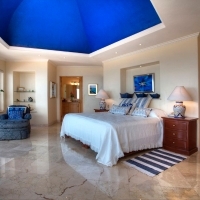 In this level you will also find a spacious and relaxing Media/family game room with giant Blue-ray TV and a full kitchen. 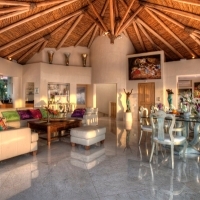  Up 1 levels from entrance is the stunning main entertaining living indoor out door space with breathtaking heated infinity pool, terrace with outdoor kitchen and dining, plus the indoor living, dining, kitchen wet bar a house made to enjoy life.